Hey music lovers and musicians! A quaint, new music emporium offering guitar repairs and customization is preparing to launch in September at 29 S. San Joaquin Street! Although revitalization of the space is still in progress, Bizarre Bazaar Music Emporium’s vibrant, yellow interior already projects a cheerful, upbeat vibe to curious passersby. With a rainbow of guitars hanging on the sunny walls; an eye-catching white drumset resting on the calico wood-paneled floor; a vintage-looking amp at the ready; and keyboards nestled throughout, the shop’s interior is an inviting playground for anyone with even an iota of musical inclination or appreciation. We had the opportunity to interview the stylish Lino Alibani, Stockton native and owner of Bizarre Bazaar, as he prepared for the bazaar’s opening. What was your motivation for opening Bizarre Bazaar? “The Man,” replies Lino mysteriously, beneath dark sunglasses. Why did you choose to open your business in Downtown Stockton? Lino offers wholeheartedly, “I believe in the city…Downtown [has a] nice vibe.” He adds that he hopes to capitalize on new foot-traffic stemming from the recent influx of new businesses to Downtown Stockton. What will make Bizarre Bazaar unique? 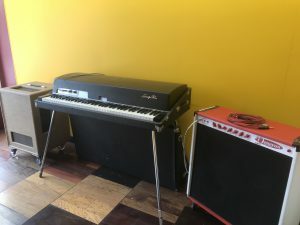 “Individuality – [you can] find stuff here you can’t find elsewhere,” says Lino, going on to mention that the shop will feature guitar customization, guitar repairs, and unusual accessories for musicians. What other Downtown Stockton businesses are you most excited about? “I love all the coffee,” he asserts, in reference to the recently established Trail, Empresso, and Terra coffeehouses sprinkled throughout Downtown. What do you like about Downtown? 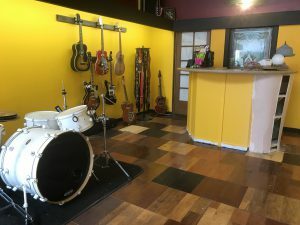 Set to officially open on Sept. 1st, Bizarre Bazaar Music Emporium will sell instrumental accessories and offer services including (but not limited to) guitar customization, repairs, and music lessons. Whether you play an instrument professionally, enjoy listening to music casually, or fall somewhere in between, make a stop at the Bizarre Bazaar Music Emporium to meet Lino and check out his unique selection of instruments and accessories. To learn more about Bizarre Bazaar and to stay in-the-know about their events, you can visit their Facebook or Instagram accounts. Their inventory will also be available on their Website.